Happy New Year and greetings from the Maintenance Department at 1757 Golf Club. I am writing this week’s blog while looking out my window at a snow covered landscape. Somewhere out there are greens and tees, I promise. As a superintendent, you are constantly asked what it is we do all winter long with snow on the ground, as we are “grass-growers”. The answer is simple, during the winter we lay the foundation for grass to be grown and turf to be maintained in the best possible environment. Contrary to popular belief, the Maintenance Department here at 1757 does accomplish many tasks during the winter other than eating donuts and drinking coffee although plenty of that transpires. We use this time of year to recharge, plan and reorganize to improve our efficiency for the upcoming season. We develop an extensive list of what we determine is “winter work” and carry out these items accordingly. The major tasks on this list include: painting/staining all amenities and posts, relocating/adding irrigation, bush hogging the natives or tall grass, landscape renovation, dead/dangerous tree removal, and bunker repair. A couple of the more notable projects are adding a drop area adjacent to #8 green and clearing the hillside on #9 making the far back tee playable again. We have started the rehabbing of some of the bunkers that are in the worst shape but the deep freezes makes working on them not possible. 1. Green Speed - Various horticultural practices will implemented on a routine basis to make the greens faster. 2. Ball Marks - We recognize that this is one of the golfer’s biggest gripes and we intend to improve on this by regularly repairing them. 3. Bunker Renovation - We understand and recognize that many bunkers have a lot of bunker liner exposed and minimal sand in them. Some bunkers will be completely gutted and relined, others will have more sand added to them or “capped” as the weather warms. 4. 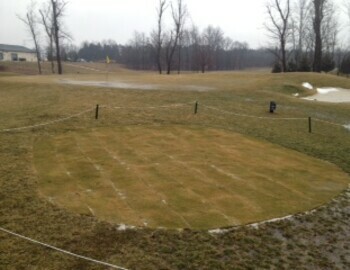 Practice Area - We hope to firm up the greens and increase turf coverage throughout the area. I sincerely hope this post not only enlightens but also gives you warm fuzzies that we are doing everything we can to make 2015 the best year yet here at 1757!